Authors: Rebecca White and Erwin Verwichte, Centre for Fusion, Space & Astrophysics, Physics Department at the University of Warwick. 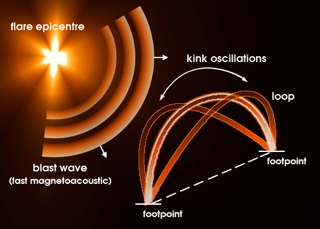 Figure 1: Cartoon of a transverse loop oscillation (interpreted as the fast kink mode) perturbed by a flare event. Knowledge of the physical conditions in the corona and coronal parameters such as magnetic field strengths are key to understanding the mechanisms behind such phenomena as coronal heating and the solar wind acceleration, which have direct consequences towards the impact of space weather on Earth. However, because of the nature of the corona these parameters are often difficult to measure locally in coronal structures. For example thermal broadening of spectral emission lines makes direct measurements of the magnetic field from Zeeman splitting challenging. These difficulties have led to the development of indirect methods such as coronal seismology  which exploits the diagnostic power of magneto-hydrodynamic waves  to determine such properties locally. The corona is a low plasma-β plasma that is highly structured into coronal loops. These are thin, density enhanced magnetic flux tubes which can be violently perturbed by dynamic events such as CMEs and solar flares. This nugget focuses on transverse coronal loop oscillations (TLOs) which are interpreted, in terms of magneto-hydrodynamic theory, as the fast kink mode [3,4]. Kink modes are characterised by an almost constant transverse displacement of the loop axis from its equilibrium position. Figure 1 shows a cartoon of a TLO event. 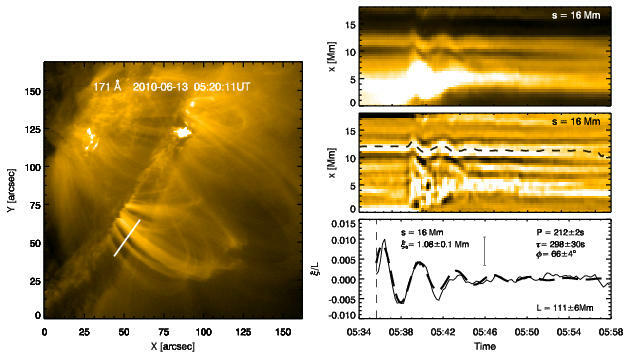 Figure 2: Following an M1.0 GOES flare on 13-Jun-2010, transverse loop oscillations were observed in an active region on the south west limb. We present an observational analysis of TLOs using data from the Atmospheric Imaging Assembly (AIA) instrument on board NASA’s Solar Dynamics Observatory (SDO). With a time cadence of 12 seconds and a spatial resolution of 1.5 arcseconds, we can study TLOs in unprecedented detail shown in Figure 2. Using the 171Å bandpass, corresponding to plasma temperatures of around 1 MK, eleven flare excited TLOs in three active regions are studied. Events one, two and three occurred on the 13th June, 2nd August and 3rd November 2010 respectively. A movie of Event one is shown below. All the loops are observed on the solar limb with estimated lengths ranging between 100 Mm and 400 Mm. A time series for each loop oscillation is found by tracking (automatically where possible) the oscillations in time-distance image cuts obtained from the data sets. Cuts are made parallel to the projected displacement direction of the loops. After subtracting a background, a damped cosine function is fitted to the time series which revealed periods between 1.7 and 10 minutes and damping times between 2.9 and 13 minutes. Figure 3: Left: Location of one of the cuts on an AIA image of event one taken to analyse a loop oscillation. Right: An example of a cut before a 2D mexican hat wavelet transform was applied to enhance oscillatory features (top). The time series has been plotted on the wavelet enhanced cut (middle). The extracted loop time series fitted with a damped cosine curve (bottom). Figure 3 shows an example of the cuts and time series analysis for a loop in Event one. The relatively short damping times compared with the periods suggest that these loops are heavily damped. This is a commonly observed feature of TLOs and several mechanisms have been proposed to describe this, e.g. resonant absorption . A significant result here is that we observe periods below two minutes which is only possible because of the short time cadence of the AIA instrument. 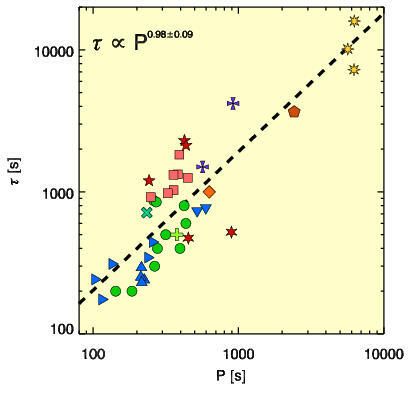 This study not only extends the parameter ranges to shorter periods and damping times but, as shown in Figure 4, it also increases the number of reported events by about a third. Increasing the range of periods and damping times is important as other variables such as the density contrast will cause a spread of the data. Therefore in order to observe a clear scaling the range must be extended. The theory of resonant absorption predicts that the scaling law between the period and the damping time has a power of one. Although the observational results cannot be directly compared with the theoretical scaling law, the observations are not inconsistent with this theory. Coronal seismology of the fast kink mode allows a range of magnetic field strengths to be determined from the observable quantities of the period of oscillation and the loop length. By applying this technique to our observations we find magnetic field strengths between 3 and 19 G. A key challenge here is to narrow down the range for each loop by obtaining an accurate estimate for the density contrast between the loop and the background plasma. Because of the optically thin nature of the corona, estimating the density contrast from EUV images is difficult as the amount of plasma in the line of sight is unknown. However novel methods of estimating this parameter have recently been proposed . Transverse coronal loop oscillations are an essential diagnostic tool in the quest to determine coronal plasma properties that would otherwise be difficult to measure directly. By exploiting new instruments such as AIA with significantly improved cadence times, previously undetected wave phenomena can be investigated and used as tools to extend our knowledge of coronal properties. Lastly, key challenges still remain in narrowing down parameter ranges as information on, for example, the density contrast is lacking. A more detailed description of this work can be found in .